Here it is, the newest addition to Tamiyas range of fun and stunt cars after the Mitsubishi Montero. 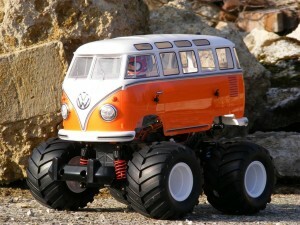 A true classic, the Volkswagen Type 2, also simply called the T1. The team of Tamiyablog was very happy when Tamiya announced that car in 2011. Wild Willy was waiting too long for a new vehicle. And i knew, i had to have this kit, as soon as possible. 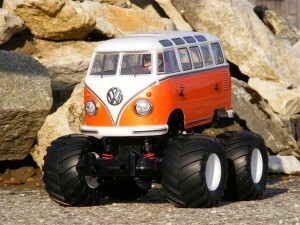 It´s very nice to see the VW body sitting on the famous WR-02 chassis. A chassis i really like. The Wild Willy 2 is still one of my favourite runners. 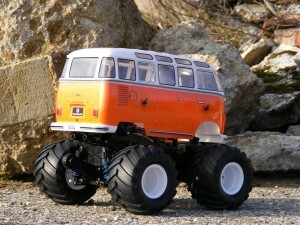 It can be a great performer with some slightly modifications like oilfilled shocks, ball bearings and a 20T pinion. 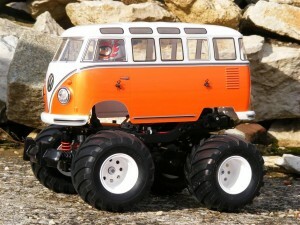 Tamiya did a fantastic job on the lexan body. Masking the body and doing the two tone paintjob takes a while, but in the end you will be rewarded with one of the coolest looking Lexan bodies Tamiya ever made. 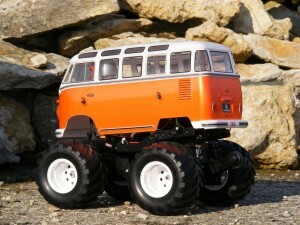 I chose a nice metallic orange for my T1 which i think suits the old VW very well. The Wild Willy driver figure is well known from one of Willys old cars, the superb “Willies Wheeler”. 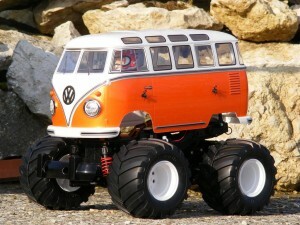 All in all i would like to thank the Tamiya Company for still producing such nice and funny cars like the VW Bus. 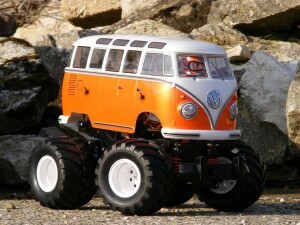 The world of RC Cars is actual dominated from mostly boring and bad looking products which are mainly speed and bashing oriented. Tamiya is nearly the only manufacturer who breaks this rule. 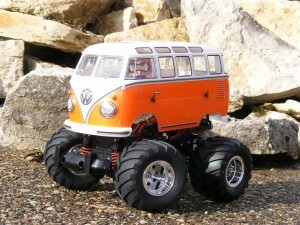 I would also like to mention the beautiful box art picture of the VW kit. 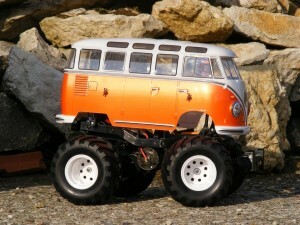 One of the very best ones Tamiya ever did. I really like to see such a piece of handmade art in our computer dominated world. Go for the Type2, it will take a smile on your face. On the shelf and on the track ! 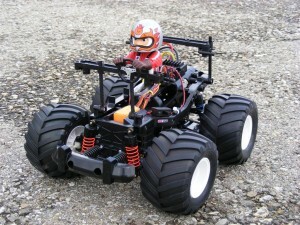 This entry was posted in Customized Builds, Reviews on February 25, 2012 by dunebuggy. The colour i used is from Parma Faskolor. It´s called Faspearl Orange No. 40302. It´s sold in small bottles. You have to use an airbrush. Nice job and great choice of colour! Though I do wonder how robust the body will be after a few crashes. I’m sure the rounded shape of the Beetle would help it get back on its wheels! Good to see other modellers using the beautiful Faskolor colours. Your Mini looks good. Much better in my opinion then the original grey. Many thanks for the video. 🙂 The WR-02 cars are so much fun.